The battle for Chunuk Bair began before dawn on 8 August, and for two days the Anzacs held this ground. You’re at Chunuk Bair, looking at the monument that was erected to commemorate the New Zealand achievement in this battle between the 6th and the 10th of August 1915. Though Chunuk Bair is not the highest point of the Sari Bair Range, this location is important because of the two spurs that run off it. One to your left goes down over Battleship Hill to Baby 700, this was held by the Ottomans. Beyond Baby 700 the spur becomes Second Ridge, which was the Anzac frontline. The other spur behind you is Third Ridge, which was held by the Turks. The Turkish-held Baby 700 blocked any attempt by the Anzacs to break out from the tiny piece of ground that they had established by the end of the 25th of April. General William Birdwood, the ANZAC commander, accepted a plan for a night advance in early August from the foothills north of Anzac Cove, up these spurs and up Rhododendron Ridge. The object of the August offensive was to capture the high ground of the Sari Bair Range. The New Zealand Infantry Brigade, under Brigadier-General Earl Johnston, was to take Chunuk Bair. It’s only a matter of a day or two now when we will be making a big attack on the Turks. Getting very anxious. So far the orders are indefinite; but everybody is speculating as to their chances. Opening the way was Brigadier General Andrew Russell’s Mounted Rifles brigade. The New Zealand Mounteds took the foothills below Chunuk Bair, including Table Top and opened the way for the infantry to be on Rhododendron Ridge just below this crest early on the morning of the 7th of August. However, Johnston hesitated, instead of attacking the summit he delayed below on Rhododendron Ridge. At that time, this high ground was all but undefended. There was an excellent opportunity to take Chunuk Bair. Finally, a telephone cable was run up the hill to Rhododendron Ridge from General Godley, whose divisional headquarters was down on the beach. Godley ordered Johnston to attack at once. By now the summit had been strongly reinforced by the Turks. The Auckland Infantry Battalion attacked in broad daylight up towards where you are standing, and were torn to shreads. The Auckland Battalion charged. It was a wonderful sight, but oh so heartbreaking! Before they could reach the crest this awful hail of lead would hit them and over they went in heaps. It was simple slaughter, but not a man hesitated and no one even thought of turning back. Nothing happened for the rest of the day. Then just before first light, at about 4.30 in the morning on the 8th of August, Lieutenant-Colonel William Malone’s Wellington Infantry Battalion swept up onto the crest, and seized this ground. The Ottomans counterattacked from north, south and east. Two British battalions were sent up to reinforce the Wellingtons, in daylight and they came under heavy Turkish fire. They broke and ran and played little further effective part in the battle. During the 8th of August, the 800-strong Wellington Infantry Battalion initially held the crest but Turkish counterattacks drove them back to the trenches just below the summit. The Wellingtons seemed to rise up each time from nowhere, and the Turks were hurled back. In the first of these attacks the bayonet on Captain Malone’s rifle was twisted by a bullet, so after this he kept it with him, as he said it was lucky. The crest became no-man’s-land. The Battle of Chunuk Bair raged on throughout the day and by late afternoon the Wellingtons held the line just below the crest but suffered heavy casualties. The Auckland Mounted Rifles reinforced what was left of the Wellington Infantry Battalion. Brigadier Johnston’s headquarters on Rhododendron ridge tried to get a telephone line to the top of the hill. Corporal Cyril Bassett a young signaller earned New Zealand’s only Victoria Cross in the Gallipoli Campaign by leading a party up to establish telephone communications. At Anzac Cove two New Zealand howitzers had been firing all day supporting the New Zealand Battle. At about 5pm some of the shells landed on the New Zealand trenches. ‘Swish! swish!’ came the shrapnel and all except two in our little trench were killed or wounded. Colonel Malone was killed the other side of me, I cannot remember where he was hit. Malone the hero of Chunuk Bair was killed by New Zealand artillery fire. 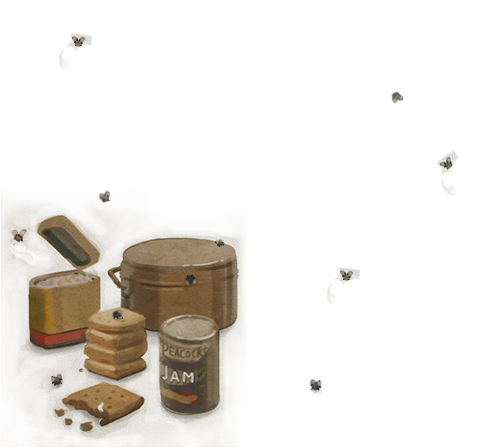 That evening the Wellington Mounted Rifles and the Otago Infantry Battalion replaced the Wellingtons. The 50 or so survivors– broken, crying, and exhausted – trudged back down the hill to the Apex. On the 9th of August the battle continued with attack and counterattack and heavy casualties on both sides. The only sign of life was the stump of an arm which now and then waved feebly for help and a voice called “New Zealand” to four listeners who could give or get no aid for him. By nightfall there were no more New Zealand battalions left and they were replaced by two British battalions. They came in and occupied the New Zealand trenches and at first light on the 10th of August they were swept away by Mustafa Kemal’s counterattack. Chunuk Bair was an epic battle. It exhausted both New Zealand brigades those not killed or wounded had dysentery, it was their last gasp, and after the 10th of August 1915 they knew it had failed. Chunuk Bair remained in Turkish hands. Corporal Rikihana Carkeek, Native Contingent. Captain John Hastings. Wellington Infantry Battalion. Chunuk Bair is a very significant hill. The climax of the Anzac campaign was reached here between the 7th and 10th of August 1915. Over nearly 4 days, thousands of Allied and Ottoman soldiers fought for these heights. Mustafa Kemal, later known as Atatürk, predicted the August offensive about a month before it occurred, and wanted his superiors to take strong measures. Corps commander Esat Pasha, who had been Kemal’s teacher, asked him which way he believed the Allies would come and in what direction. Using his arm, Kemal drew a half-circle from north of Anzac Cove through the gullies to the top of the hills, to the hill behind us, which is Hill 971. Kemal reckoned that the Allies would carry out two operations simultaneously, he predicted that if the Allies also landed in Suvla then the Turks would have a nightmare up here on Chunuk Bair. Mustafa Kemal’s teacher patted him on the back and said, ‘don’t worry, my son, only bandits can walk through this country’. But Kemal was right and on the 6th of August, the Turks lost the Lone Pine trenches, and the British army landed at Suvla. Two days later, the Wellington Infantry Battalion managed to occupy trenches below the crest here at Chunuk Bair. At first, the New Zealanders didn’t meet much resistance at the top. The Turks may have retreated because there was no leader. And even though the Turks then counterattacked, it was impossible to push the New Zealanders back. During the 8th of August, General von Sanders, the German in charge of the Ottoman 5th Army, appointed Mustafa Kemal to command the sector that included Suvla and Chunuk Bair. Von Sanders believed Suvla to be more important than Chunuk Bair. On the 9th of August with Mustafa Kemal in command, the Turks counterattacked and stopped the British army advancing at Suvla. At Chunuk Bair, repeated Turkish attacks over the last two days had depleted the New Zealand forces. And British reinforcements had been called in. On the night of the 9th of August, Mustafa Kemal returned to Chunuk Bair and spent the night somewhere around here, about 300 metres from the crest. There were nearly four Turkish regiments fighting here against the New Zealanders, but nobody could secure the summit. Kemal wanted to mount one final advance, as he believed that by a sudden overwhelming advance he could regain the trenches lost to the New Zealanders. A staff officer told him that they had lost very heavily during the last few days, and if this counterattack was not successful, there would be no soldiers left. But even though it was a desperate situation, Mustafa Kemal was confident of victory and told everyone to prepare for a counterattack. Three regiments were placed along this ridge on the Turkish side and Mustafa Kemal made a short speech to his men. He stood like a statue for a while. When he cracked his whip, the Turks counterattacked. The Allied positions on the summit were now held by British reinforcements. Even though many advancing Turks were mowed down, eventually, the British defenders couldn’t stop them and the Turks swept through their lines. The Turks advanced down towards the New Zealanders who had machine guns on Rhododendron Ridge. The New Zealanders started firing and stopped the advancing Turks. Then the Allied navy started pounding this hill, firing thousands of shells. New Zealand soldiers reported seeing thousands of Turks lying dead and wounded. During this bombardment, a piece of shrapnel hit Mustafa Kemal, but his pocket-watch saved his life. The shrapnel broke the watch but Kemal only received a bruise. If Kemal had been killed Turkish history would have been very different. For New Zealanders, the 8th of August 1915 was an important day because they got to the top of Chunuk Bair. For Turks, the 10th of August was an important day because they were able to sweep the invaders back from the heights. If you have walked the New Zealand track from No.2 Outpost then follow the track up to its end on the crest of the hill. Turn left and walk to the New Zealand National Memorial. If you are coming from Baby 700, take the Conkbayiri road from Baby 700 and continue two kms. You will pass the Turkish Conkbayiri Mehmet Memorial (five large stone monoliths) on your left. You will reach an intersectin, turn left here and you will be able to see the New Zealand battlefield memorial on the summit of Chunuk Bair. Stand on the drain to the right of the New Zealand battlefield memorial and the Ataturk statue. Look towards the New Zealand battlefield memorial. From the ferry wharf in Eceabat, turn left and follow the road along the Dardanelles coast 200 metres before it turns right, looping around the back of the town. Follow this road north for two kms until you reach the roundabout near the coast, signposted for Anzak Koyu (Anzac Cove). Turn left and drive 6kms across the peninsula. This will bring you to the Aegean coast, with the road turning north. Follow the coastal road past Anzac Cove and drive along the coast till you come to New Zealand No 2 Outpost Cemetery to the right of the road. Just before the cemetery there is a dirt track, follow this track inland for about 50 metres, till you come to a smaller trail on the left leading through the scrub. 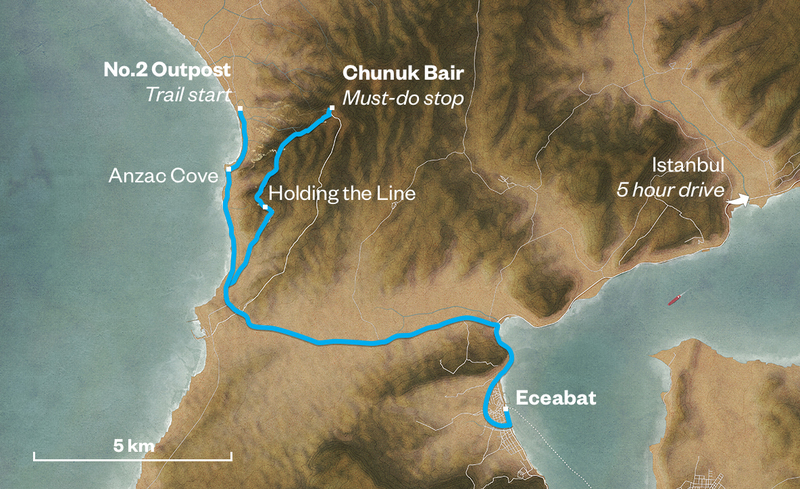 Take this side track, which is the starting point for the New Zealand track leading up to Chunuk Bair. Follow the track upwards, climbing a dozen or so stairs cut into the earth, till you come to a small saddle with a view of the hills and rugged terrain leading up to Chunuk Bair, site of the New Zealand memorial on the horizon. Follow the trail to the right, looking out over the Anzac sector. From the ferry wharf in Eceabat, turn left and follow the road along the Dardanelles coast 200 metres before it turns right, looping around the back of the town. Follow this road north for 2 kms until you reach the roundabout near the coast, signposted for Anzak Koyu (Anzac Cove). Turn left and drive 6 kms across the peninsula. Take the road signposted for Chunuk Bair (the Conkbayiri road). This road is one-way, though there is the chance you could meet oncoming traffic because some drivers don’t follow these rules. You will pass the Turkish Conkbayiri Mehmet Memorial (five large stone monoliths) on your left. You will reach an intersection, turn left here and you will be able to see the New Zealand battlefield memorial on the summit of Chunuk Bair. Allow 2 hours to explore the entire Chunuk Bair trail. Note that the trail is steep and rugged and requires a degree of fitness and mobility. If you want to go up but not down you can get someone to meet you at the top. If you’re short of time, you can simply visit the must-do stop on the trail – Chunuk Bair. The audio guide at the summit gives you the big-picture Chunuk Bair story.